The Suzuki Method is used world-wide. The method provides instruction in a wide variety of instruments including piano, violin, viola, cello, bass, guitar, harp, flute and recorder. 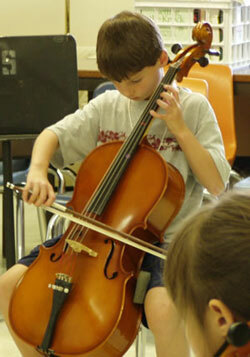 The primary purpose of the Suzuki Method of talent training is not necessarily to develop outstanding musicians. The true measure of a successful student, according to Dr. Suzuki, is the quality of the person. The musical instrument is merely a tool to help him or her to become a fine person. That being said, the method can also produce very fine musicians. Dr. Suzuki shows us that every child can succeed and play at a very high level if: 1) A natural method of learning is used, 2) the child is given an early start, 3) the child is surrounded by a rich environment, 4) the child engages in a concentrated study, and 5) the child is exposed to a dedicated instructor. A natural method of learning involves a lot of listening to music, much like children listen to language before they learn to speak. A natural method also entails fun for both child and parent -- nothing says that learning has to be unpleasant! An early start means most Suzuki students begin at age four or earlier. This does not mean an older child should not take up the method, however, because the Suzuki Method is based on the view that every child can learn. A rich environment is largely the responsibility of the parent and the instructor and incorporates both fun and challenging elements. One of the key points to the Suzuki approach to teaching music is that the parent, child and teacher are an integral team. Parents are expected to come to all lessons, observe the lesson, and take notes so they can be the teacher at home as the child practices. Encouraging hard work and concentration at a young age takes time and patience to develop, but provides children with a valuable life-long skill. Finally, a dedicated and well-trained instructor is essential because the teacher guides student and parents alike. The Suzuki Association of the Americas (SAA) trains Suzuki Method Teachers to ensure quality teachers are available. Shinichi Suzuki was a remarkable violinist, educator, philosopher, and humanitarian. Born in 1898, he was the son of Japan's first violin manufacturer. Although he began his violin studies in Japan, in the 1920's he traveled to Germany to continue his studies. After returning to Japan, Dr. Suzuki taught violin at Tokyo universities where he began to work on a new method for teaching music to children. His approach was based on his observation of how easily children learn their native language. In 1945 he gained an opportunity to try out his new method when he was invited to teach at a school in Matsumoto. Over the next 30 years, Dr. Suzuki extensively researched and refined his method, known as "Talent Education." He developed a series of violin repertoire books to present musical education in a fun, logical and sequential manner. Teachers from around the world began to travel to Japan to study Dr. Suzuki's methods and in 1958, Suzuki's Talent Education was introduced to the United States. 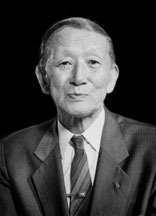 Dr. Suzuki maintained a very active leadership role in Talent Education until his death in January of 1998.